There are three decks in the game. The fight deck, the island deck, and the aging deck. Let’s talk about the fight deck first. The fight deck represents Friday’s knowledge of survival on the island. As you would expect, in the beginning, he is terrible at it. The deck has a 2, three 1s, a whole bunch of 0s, and five -1s. Whaaaat? His average value for the deck is zero? Yes indeed. Challenges will allow you to flip a number of cards for free, and compare the value of the cards to the difficulty of the task. If you meet or beat it, you can add the challenge to your deck as a valuable skill. If not, you lose health. And here is the first point of brilliance in the game. Whenever Friday loses a challenge, he loses life (food) equal to the difference between the two values. So if I go after a challenge value of four, and end up with a two, I lose two life. Whenever I lose life in this way, I can take cards used in the challenge, and remove them from the game. Deck thinning is a familiar strategy in deck builders, and anyone who knows the power of chapel will be quick to pick up on why this is a good idea. Let’s go with an example. You are Exploring the Island. You get to flip 3 cards, and need a value of 2 to succeed. Your first is a 1. Halfway there! Your second is a 0. Your third… is a -1. Oh no! Your total value drops down to 0, meaning you fail by 2! You lose two life, and can remove both the 0 and the -1 from your deck. You failed the challenge, but got rid of some bad cards. Win, and get a new, powerful card. Lose, and remove bad cards. You always improve your deck. For the first third of the game, almost all the challenges have a difficulty of 1 less than the number of cards you draw. As most of your deck is going to be 0s, this means that you will be able to destroy all but one of the cards played on a challenge. But if your total is negative, you get to get rid of all of them. The fact that your deck is filled with -1 cards doesn’t feel penalizing because they almost always remove themselves in the early game. I have to believe that was the designer’s intention, based on how well the other mechanics work out. Even the unfortunate case of getting a +1/-1/-1 is mitigated by the design. At any point, you can pay a food to draw a card. So in the above case, where you are losing by 3 (and thus would be able to get rid of 3 cards) you could simply draw another card to get rid of. If it is a +1, you are only losing by 2, so you lose the two -1 cards. If it is a 0, you get rid of the two -1s and the 0. If it is a -1, you can draw an extra card, flushing your deck out further. It does cost you extra food to do this, but it can make your deck very strong in the early game. Alright, enough about the mechanics of fighting. Let’s talk about the strategy. The island deck is full of challenges, and each turn you reveal two of them, choosing which one to go after. These range from easy challenges like “Flip 1 card to make a 0” to hard challenges like “Flip 5 cards to make a 5”. Let’s say you are a dominion veteran, and want to thin your deck as much as possible. You go after the hard challenges, remove all those 0’s and -1’s, and finish the first pass through your deck with a svelte set of 1s and a 2. You are going to power through these challenges! Except that is where the aging cards come in. Whenever your fight deck empties, you have to take an aging card, and add it to the deck. These range from stopping your free cards, to -2s, or even a -3 on higher difficulties. Age enough times, and you could become Suicidal, getting hit with a massive -5 penalty! Not only that, but these take 2 food to remove from your deck instead of 1! Trim your fight deck too much, and you will be overwhelmed with aging cards. The aging cards beautifully solve the veteran strategy of deck thinning. “Oh.”, you say. “Well, I’ll just fill my deck with the simple challenges, so I’ll never have to hit the aging cards.” Most of the easy challenges give you a 0 power and an ability, so they don’t drastically improve your deck. Their main purpose is to keep those aging cards away, while giving you a modicum of strategy. But here’s the next important point: You have to go through the island deck 3 times, and each time you go through, the challenges get much harder. Filling your deck with easy challenges not only makes future challenges more difficult by not having any of the easy challenges available to defeat, but winning every challenge makes the island deck thinner, giving you less time to prepare for the pirates. The combination of having worse cards, harder challenges, and less time to prepare can easily spell disaster. What is the answer then? A middle ground. Don’t be overly aggressive in thinning your deck. Don’t be overly aggressive in beating challenges. Somehow, mechanically, the designer has managed to make the hybrid strategy the dominant one. This makes gameplay much more interesting, as you can be flexible with your decisions instead of being forced to follow the “optimal” strategy for success. The interaction between the aging deck (penalizing heavy thinning strategies) and the island deck (penalizing going for exclusively easy challenges) makes the game mechanically tight. If you would like to watch it played, you can check out Rahdo’s run through. Rahdo does great play videos where he goes through his decision making process, and I find it helpful to learn games for the first time. 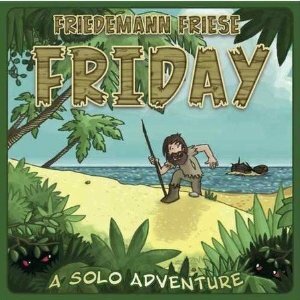 If you would like to try Friday for yourself, you can pick it up from Amazon through this affiliate link (or support your friendly local game store!) I know solo games aren’t for everyone, but it was cheap enough for me to find the purchase worthwhile.